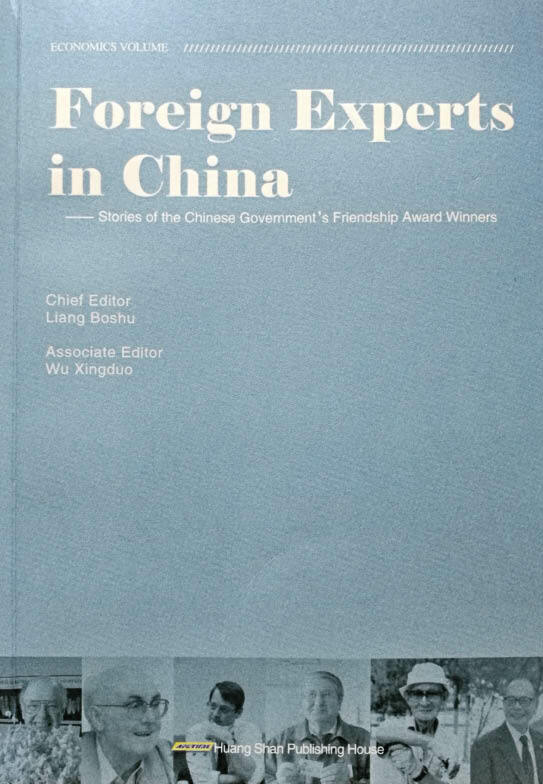 THE book series Foreign Experts in China has three volumes, each focusing on 10 figures eminent in areas of economy, culture, education, as well as science and technology, and telling the stories of their work and life in China. Liang Boshu is chief editor of the book series and also editor-in-chief of International Talent, a periodical published by the State Administration of Foreign Experts Affairs. He and his deputy Wu Xingduo both have rich experience in interviewing, writing, and editing the stories of foreign experts. The book series records the accounts and experiences of a group of foreigners coming from different countries, and possessing expertise in their respective areas. Working in publishing houses, diplomatic and cross-cultural exchange organizations, foreign embassies and consulates in China, Chinese research institutes, universities, and overseas Confucius Institutes, these foreigners are experts, diplomats, and teachers who have devoted themselves to China’s economic and social development, pursuing their own dreams and realizing their own values in the process. Working and living in China gives them not just valuable memories, but also enables them to form deep friendships with local people, which adds an intangible and unforgettable human element to their lives and stories. Their stories encourage more international friends from across the world to choose China for their career development. The Chinese government’s Friendship Award was set for experts from the Soviet Union and Eastern European countries that came to China in the 1950s, and then developed into an award for foreign experts who make great contributions in China’s process of modernization and the cause of reform and opening-up. It is the highest honor given by the Chinese government. On the National Day, winners would be invited to Beijing to participate in the awarding ceremony and meet with the top national leadership for the conferring of the award. Experts included in the three volumes are all winners of the Friendship Award. They have made remarkable achievements in their respective areas of expertise, and have been widely reported among Chinese people. Coming from various countries with different ages, some of them have passed away, while some are still active in their work in China. Some are well-known to every household, for example, the former president of Cornell University and current deputy vice chancellor of New York University Shanghai Jeffrey S. Lehman, known as “female Bethune from Russia,” Popova Liliya in China’s Daqing City of Heilongjiang Province, and old China hand Professor William N. Brown of Xiamen University. Some are prestigious scientists, such as “Mr. Anti-Virus” Eugene Kaspersky, semiconductor expert Z.I. Alferov, international space research expert Roger-Maurice Bonnet, and the Nobel Prize laureate in physiology or medicine Barry J. Marshall. Some are famous in the economic sphere, for instance, CEO and Chairman of Lufax Gregory D. Gibb, and German experts of grape grafting techniques Norbert Gorres and Hans Beu. Late German expert Werner Gerich (1919-2003) was the first “foreign factory boss” to head a Chinese state-owned enterprise since the country launched reform and opening- up. In August 1984, Werner Gerich became one of the three senior retired experts of Senior Experten Service (SES) who was sent from Germany to Wuhan. After a four-month investigation on Wuhan Diesel Engine Plant he became its technical advisor, and later in November was appointed the factory boss. His bold reform, strict quality control, and market-oriented management transformed the small factory. It began to export diesel engines to seven Southeast Asian countries with an annual export capacity of 5,000, earning more than one million US dollars, a stunning achievement for its time. In 1986, Werner Gerich was given the rights of permanent residence by the Chinese government. “Living in China is like riding on the high-speed railway. Passengers may know where they go but cannot guess where the next turn is.” CCTV-9’s former anchor, New Zealander Edwin Maher expressed the same feeling. He often writes articles for China Daily to introduce changes in China to foreign readers. China’s modernization is inextricably linked to these foreign experts who have come to China from the 1960s to now. They witnessed the construction of a new China and later devoted themselves to China’s reform and opening-up. Now they stand in the center of international arena together with China in the new era.